I love basketball, especially the college variety; you probably know that. I fell in love with the game in the New York suburbs, where I grew up. Our high school team was composed largely of black players who had honed their skills on the playground since they were little boys. Even back in the 50’s, their athletic skills, flashy moves and fast pace made it fun and exciting to watch. Then, life happened. I lost touch with all sports until my own boys were in high school. I started going to games to support the pep band they played in and quickly remembered how much fun basketball was, the way a good, exciting game could lift me out of the chores and troubles of everyday life for a couple of hours on a weekend night. And I was hooked. From there, it was a short step to watching our local college games, then a few games of the annual March Madness tournament. Then, the whole thing. Every year about this time, I watch game after game until my eyes glaze over and I have basketballs bouncing through my brain. But I look forward to it like a gourmet expects a feast. Basketball has changed markedly since the 50’s. Now, black players are the norm; their flashy beautiful moves, honed on thousands of playgrounds and high school courts, daily fare. Now it is a major sport, not just something to occupy a fan’s time after football and before baseball. Now the whole country gets caught up in March Madness…as do folks world-wide. But what I love about the game –the speed, the impossible shots, the buzzer-beater finishes, the athleticism, the sheer joy of watching young people do well what they do best—has not changed. Like Loyola of Chicago did this year. I was surprised when they beat Miami of Florida, amazed when they beat Tennessee, shocked when they beat Nevada, and out of my seat cheering when they beat Kansas State. Here they were, a little 11-seed from Chicago, a team no one had heard of, going to the Final Four. I love it that, even in this age of endless statistics and endless, ear-numbing analysis, no one can predict what is going to happen in any game on any given night. I love it that, in a year haunted by accusations of huge money and widespread corruption, of $39 million contract buyouts and $100,000 player offers, a team no one knows from a school no one heard of can simply go out and play…and win. 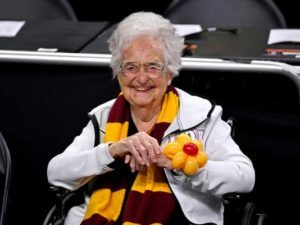 I love what Loyola called their “secret weapon”—98-year-old Sister Jean with her burgundy and gold scarf, sitting in her wheelchair with that sparkle in her eye, praying with the team before the game. I love her joy, her enthusiasm…and the fact she is 20 years older than I am. What an inspiration! In a year when all the news seems to be so ugly, it’s wonderful to have some good, honest fun. Stories like Loyola’s are why I watch all those games in the first place. I think Sister Jean knows that, too. “We just need to come together, enjoy a game and have a good time,” she remarked during one of her many interviews. Even though they lost in the semi-finals, Loyola emerged from the Tournament as winners. They’ve proved to us that it’s still possible for the underdog to succeed, that David can still take down Goliath, with faith, determination and the right stones in his sling. Thanks, Loyola! I needed that!